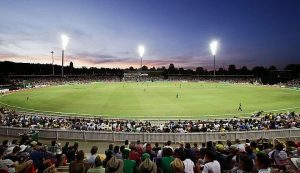 Canberra’s Manuka Oval made history this week, hosting its maiden Cricket Test Match, and SoldOut played a key part of this milestone event by providing the ‘look and feel’ collateral for the stadium. As Australia and Sri Lanka took to the field in Australia’s capital for the Domain Test Match, the 12,000-seat stadium was dressed with grandstand and venue signage, way-finding signage and mesh fence dressing. SoldOut Senior Project Director for this program Matt Copper said there were multiple layers to the project which included concept, design, build and installation. “With more than 25 years of experience delivering world-class international events, Sold Out is equipped to deliver more than just event operations. With the match generating much interest and media coverage not only in Australia but internationally, it was important for the stadium looked its best. “Ensuring all fans can find their way around the venue, their seats, food, water, sunscreen and medical is a big job, and this project certainly had some impressive stats. “We designed, built and installed 254 pieces of signage, over 1000m of mesh scrim and 478.6sqm of grandstand dressing. “We also created an impressive staircase and wall feature which use around 50sqm of greenery,” said Cooper. It took 12 years of lobbying from Cricket ACT to host a match in the nation’s capital, and SoldOut was proud to be part of this landmark event. The Cricket Australia Domain Test Match runs from 1-5 February 2019. For more information and results, visit the Cricket Australia website.